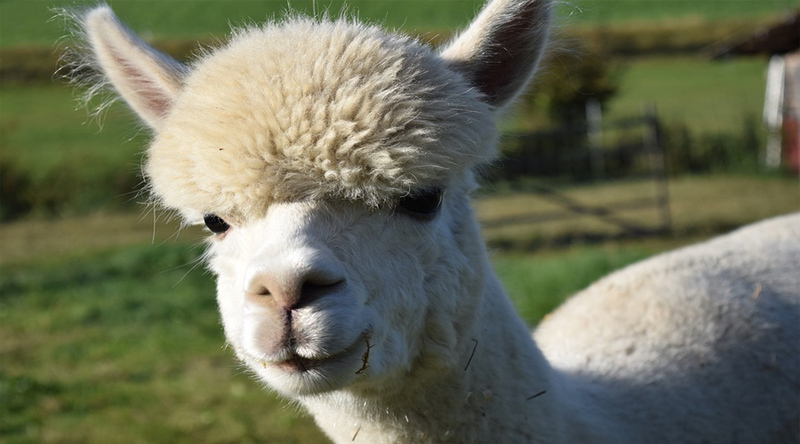 Depends on the breed; Suri Alpacas have fluffy wool, Huacaya Alpacas have much longer, yarn-like coats. Colors usually range from white/buff to black. About the Animal: Alpacas are part of the camelid family, just like giraffes, camels and llamas. Bred from wild Vicunas, they are an entirely domestic species. Unlike Llamas, Alpacas were bred almost exclusively for their wool, which is naturally fire-resistant, wonderfully soft and hypoallergenic. Just like all of their relatives, Alpacas are able to spit, but tend not to, even under duress. They are a very vocal species that groans, hums, chirps and ‘sings’ almost constantly. Mating and Reproduction: Alpacas are “induced ovulators” meaning the act of mating causes ovulation. Males reach sexual maturity between one and three years of age; female between 12 and 24 months, although most breeders do not allow them to breed until they are about 2 years old. Gestation is about 345 days, and results in a single offspring, or cria. Amazing Information: There are actually two different types of alpacas, the Huacaya and Suri. They have different textures of wool. Huacaya tend to be like ’fluffy teddy bears’ and are more common. Suri Alapcas have longer, curlier locks.